Minutes of Meeting Sample – There are times, in any organization where the members, volunteers or employees just need to get down to business. There have been numerous meetings on a particular subject or project. Now the time has come when the ideas are consolidated and organized so the team can get down to business. A special Minutes of Meeting Sample helps to bring all the ideas together, so that the action plan can be implemented. Goals have been set, now it is time to take the appropriate action to meet those goals. This template has room for the usual data needed as part of record keeping. It includes areas for the meeting date, time and location. It identifies the project manager, the person recording the minutes, the attendees and those who are absent. 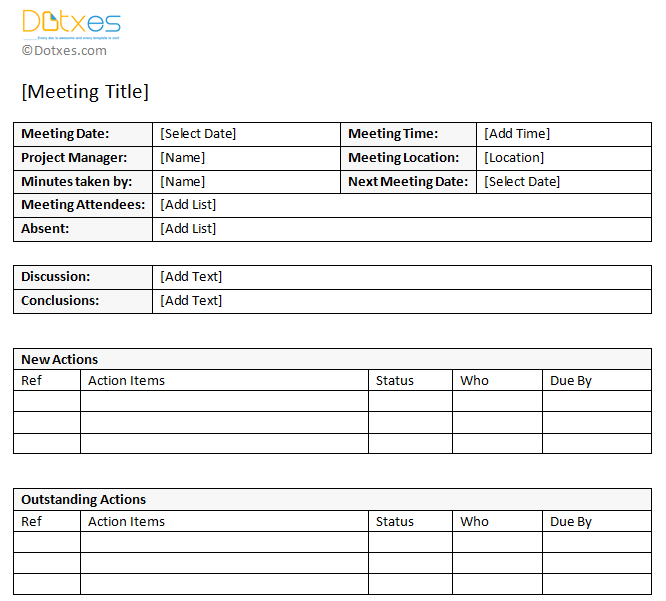 The Minutes of Meeting Sample then provides a place for new action items. This portion of the template, provides space for a reference number. This could be a project number, completion date or some other form of name or some other form of group identification. Next the action item is listed, the status, such as to start date, assignment accepted, or work underway. The person responsible for this item is identified, and a due date is listed. The Outstanding Actions are those tasks still to be completed. These tasks may have either and are nearing completion. They may include one or more items that have yet to be assigned, or eliminated for various reasons. With a copy of this completed template, all participants will know what is expected of them. They will know what the other project members have accomplished and what remains to be done. Everyone involved is reminded that the project is important, and each team member needs to be doing his part. It shows the progress or lack of progress on various items and identifies items, which may, in fact, be duplicates of other items, but with different wording. Reducing the project to this simple page tells the participants that management knows what it wants and expects the project members to be aware of their responsibilities and to meet their deadlines. Using the Meeting Minutes Template as a central source of information, instead of everyone taking their own notes assures that the agreed-upon plan is followed, and the objectives are met. Finally, the Meeting Minutes Template brings the team together, since everyone will realize that it is the success of the project that will demonstrate to management the dedication of the team members. It may look like just a piece of paper, but the Meeting Minutes Template designed is a way of pursuing action items can help put or keep a project on track and make all participants aware of their responsibilities. I needed a template for my PMs in a new PMO for a Meeting Agenda with Action Items. This was perfect. Thank you. I will be using it in my meeting today and let you know if it is suitable and works well. thank you so much@!! Neat and clean template which captures all details. Thank you.